522 pages | 496 B/W Illus. 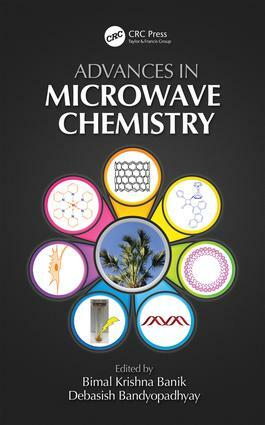 Advances in Microwave Chemistry discusses the novel bond formation methodologies, synergistic effects of microwaves with other entities, sample preparation including digestion, combustion, and extraction techniques, as well as selectivity in chemical processes. Recent updates are provided on microwave-assisted syntheses of pharmacologically significant aza-, oxo- and other heterocycles, including lactams, nucleosides, bile acids and sterols, the preparation of nanomaterials, composites, and absorber layer materials for thin film. This book also incorporates comparative discussions involving microwave irradiation with conventional methods in different aspects of organic, inorganic, medicinal, and green chemistry. Dr. Bimal K. Banik is the Vice President of Research and Education Development of Community Health Systems of South Texas. He was a Tenured Full Professor and First President’s Endowed Professor at the University of Texas-Pan American and an Assistant Professor of University of Texas M. D. Anderson Cancer Center for many years. He was awarded Bachelor of Science Honors Degree in Chemistry from Itachuna Bejoy Narayan College and Master of Science Degree in Chemistry from Burdwan University. He obtained his Ph. D. degree based upon his thesis work performed at the Indian Association for the Cultivation of Science, Jadavpur. Dr. Banik was a Postdoctoral Fellow at Case Western Reserve University (Ohio) and Stevens Institute of Technology (New Jersey). He is a Fellow (FRSC) and Chartered Chemist (CChem) of the Royal Society of Chemistry.Dr. Banik has been involved in organic, medicinal chemistry and biomedical research for many years. As Principal Investigator, he has been awarded $7.25 million USD grants from National Institutes of Health, National Cancer Institute, Kleberg Foundation, University of Texas M. D. Anderson Cancer Center, University of Texas-health Science Center and University of Texas-Pan American (UTPA). Debasish Bandyopadhyay studied chemistry at the Chandernagore Government College and the University of Burdwan (India). He received his Ph.D. in 2004 from the University of Calcutta (India), the oldest university in the South-East Asia. He performed his first postdoctoral research at the same university with Professor Asima Chatterjee and Professor Julie Banerji. In 2007, he joined at the University of Texas-Pan American as a NIH/NCI postdoctoral fellow with Professor Bimal K. Banik in the Department of Chemistry. In 2011, he was appointed as Assistant Professor of Research in the same department. His research foci include, but are not limited to, development of greener methodologies aiming to the synthesis of novel pharmacophores; design, in silico validation and synthesis of anticancer compounds; extraction, purification, structure elucidation and chemical modification of plant natural products targeted to pharmacologically active molecules. He has authored 67 international patent/book chapter/journal articles. Presently he is engaged as Associate Editor with two internationally reputed journals and Editorial Board Member of eight international journals.